1975- Loung Ung was five years old and lived with her middle class family in Phnom Penh. The city was invaded by the Khmer Rouge and they forced Loung and her family to travel for seven days. The family needed to pretend they were poor peasants, because her father worked for the government-- those who had worked for the previous government were killed. They lived with her Uncle for a few months, but when they feared people from Phnom Penh would recognize them, they moved to another village. 1975-1976- The family was forced to move to Ro Leap Village, where they worked 12 hour workdays and were given very little food portions. All their clothes were burned and were forced to wear, what Loung called, black pajamas. Loung's older two brothers, Meng and Khouy, are forced to work in a separate camp. Her sister, Keav, must leave to work in a camp for teenagers. 1976- Keav, dies from food poisoning. Not long after, her father is taken away by two Khmer Rouge soldiers and never returns. 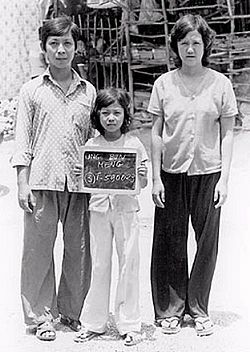 1977- Loung's mother insists that Loung and her two siblings leave Ro Leap Village and pretend they are orphans to keep them safe. Her brother, Kim, walks in one direction. Chou and she decide to stay together. Because of Loung's fiery nature, she must go to the camp where they train child soldiers. 1978- Loung's mother and baby sister, Geak, go missing. They are never heard from again. 1979- The "Youns," or Vietnamese, invade the villages to fight against the Khmer Rouge. Loung, Kim, and Chou unite, and find a foster family. They must flee from any attacks from the Khmer Rouge. They eventually find their older brothers, Meng and Khouy, and go to their Uncle's village. Meng and Loung get smuggled into Vietnam, then to a Refugee camp in Thailand. 1980- Loung receives a sponsorship from America to get an education. 1996- Joined the Vietnam Veterans of America Foundation. 1997- Was awarded a Herbert Scoville Jr. Peace Fellowship. She became a national spokesperson for a campaign for a Landline-Free World, which won the Nobel Peace Prize this year. 2000- Published First They Killed My Father: A Daughter of Cambodia Remembers. The book was a national bestseller. She also published the sequel this year, Lucky Child: A Daughter of Cambodia Reunites with the Sister She Left Behind. 2001- Won the Asian/Pacific American Librarians' Association award for "excellence in Adult Non-fiction Literature." It was also pronounced by the American Library Association as a "Best Book for Young Adults." 2012- Published Lulu in the Sky: A Daughter of Cambodia Finds Love, Healing, and Double Happiness. 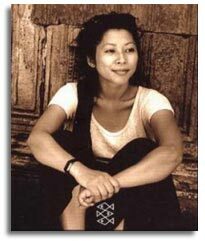 2013- Loung Ung was one of the nine writers of the film "Girl Rising." Loung Ung has been received well for her work. She was selected by The World Economic Forum as one of the "100 Global Youth Leaders of Tomorrow." She has been recognized in The New York Times, Washington Post, USA Today, Boston Globe etc. and has been on multiple television and radio shows, including ABC, CBS, NBC, CNN, and Fox. She is an activist in the United States as well as many other countries. She won the ALAPA award for "Excellence in Adult Non-fiction Literature" in 2001 and was selected by the ALA as a 'Best Book for Young Adults'.